The Unknown Cook has been to quite a few beautiful places. None have been as exquisitely captivating as the picture above. The colors alone draw you closer to a place you can only wish you were with the snap of your finger. This is Singapore. And somewhere in the midst of this lovely place is where we discovered the illustrious Stella San. 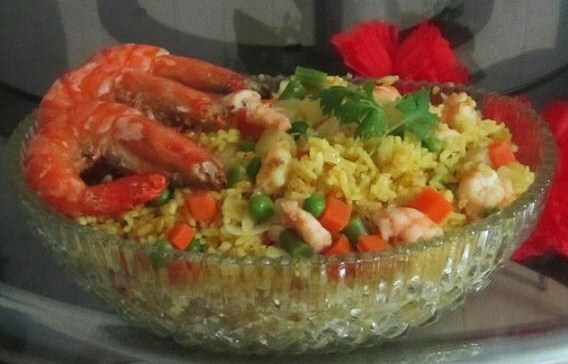 This Aromatic Pineapple Rice with Prawns looks so succulent! Stella is a native of Singapore. She also has an admirable gift which made us seek her out for this story. Just as beautiful as the city in which she lives, Stella creates some of the most appealing dishes that make us wonder how it was done and hungry all at the same time. Over at her website, Yeah I Like, you will find some amazing recipes and healthy eating and dieting tips that will surely be beneficial to your lifestyle. We were happy Stella granted us the opportunity to peek inside her busy life. We found that she is just as interesting as the dishes she prepares. The Unknown Cook prepares 8 Questions with Stella San. The Unknown Cook: Stella, The Unknown Cook Community loves what you create with your delightful dishes. What makes your dishes special to you? Stella San: Thanks for your compliment. My dishes are special to me because they are home cooked food for My Beloved Family. The Unknown Cook: When did you first stumble upon your love for food and for cooking? Stella San: When I was working In a Japanese bank, I often ate a variety of food and cuisines of different cultures. My love for cooking started 3 years ago. The Unknown Cook: What would you say is your biggest challenge when preparing food for family and friends? 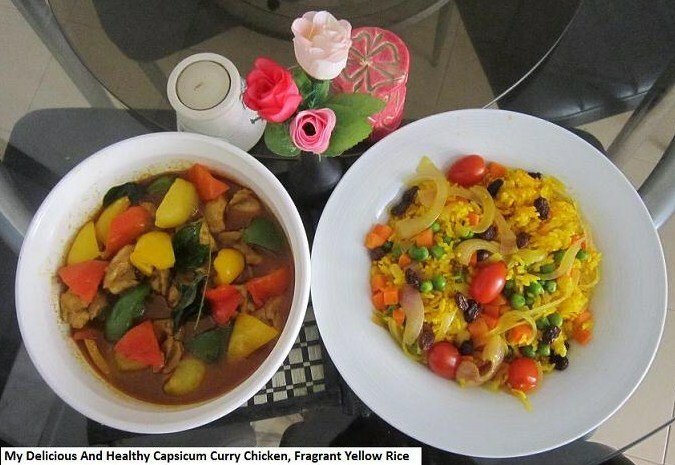 The recipe for this awesome Capsicum Chicken Curry dish is easier than you think! Stella San: The biggest challenge is to buy fresh ingredients from different local food stores. The Unknown Cook: Do you have a current ingredient obsession? If it’s a secret ingredient, do tell. Stella San: My beloved ingredients are different kinds of instant curry powders and pastes. I have no secret ingredients. The Unknown Cook: What would you throw together from your pantry if you had only 10 minutes? Stella San: I would throw together dishes like Buckwheat and Green Tea Noodles (sprinkled with Seaweed and Fish Flakes), Egg Omelette with a lot of Spring Onions and Capsicum. The Unknown Cook: In regards to your healthy recipes, which by the way look very appetizing, which are your favorite to make? Stella San: Healthy and Appetizing Recipes such as Capsicum Curry Chicken, Spring Onion Capsicum Omelette and Mee Rebus. The Unknown Cook: If you could travel to any city in the world just for dinner, where would you go and why? Stella San: I would like to travel to Beijing, Shanghai and Tokyo just for dinner. These cities have rich food cultures and I like the rich variety of foods they have. The Unknown Cook: What is your guiltiest pleasure in the food world? Stella San: An entire Barbecue Piglet. There is a lot fat under the skin. Yummy! I feel so guilty but enjoy eating it. Stella, we appreciate you immensely for reserving the time to allow The Unknown Cook to have a glimpse of the awesome cook behind the food. We don’t know if we will ever come to Singapore. But if we do, we are surely coming to dine with you! In the meantime, we will hangout at Yeah I Like to learn how to cook your amazing dishes! Posted on August 19, 2014, in Uncategorized and tagged capsicum, capsicum chicken, capsicum chicken curry, chicken curry, chicken recipes, chinese cuisine, chinese food, cooking, cooking singapore, curry, dieting, diets, healthy food, japanese cooking, oriental cuisine, pineapple rice, rice, rice diet, rice recipes, rice shrimp, shrimp fried rice, singapore, singapore cuisine, singapore dishes, Stella Stan. Bookmark the permalink. 1 Comment. I have known Stella San quite recently but I love her style of cooking along with her gorgeous photos..